An elegant, mobile-ready, minimalistic theme. One is a mininal blog theme for Hugo, which is forked from onetwothree. It provides some new features and simplification. I tried to keep it simple with less configuration to write rather than play with a theme instead. You can check out the demo at https://resugary.github.io/hugo-theme-one. Take a look inside the exampleSite folder if you get stuck. Copy the config.toml in the root director of your hugo site. # End your baseURL with a `/` trailing slash, e.g. `https://example.com/`. 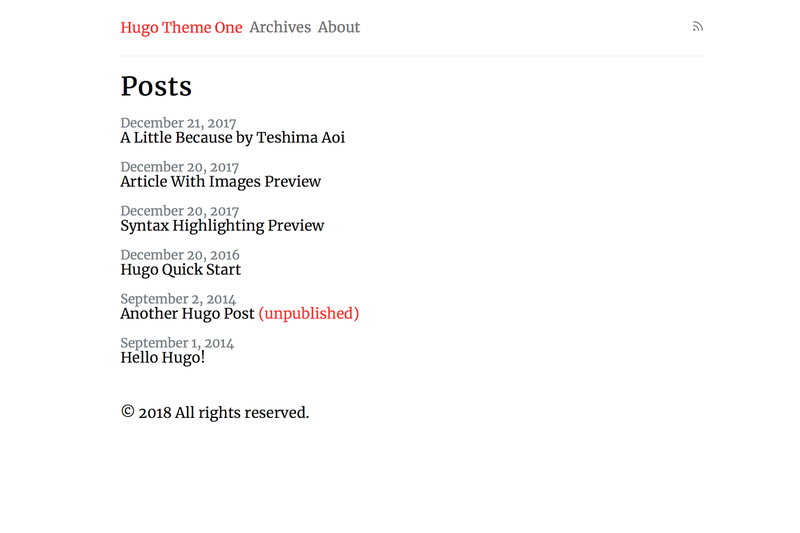 title = "My Hugo Site"